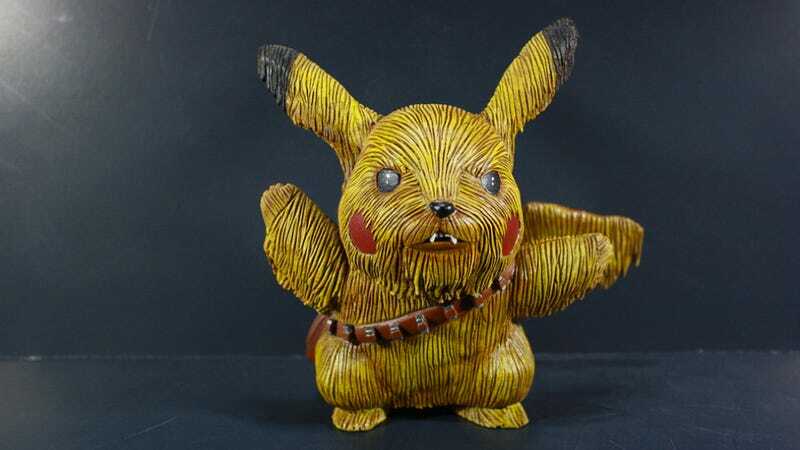 It's Han Solo's co-pilot, Chewbacca, crossbred with Ash's buddy, Pikachu. The result? Wookimon? Chewbachu? Pikachewie? Yes, Pikachewie. I used a Jakks 2007 Electronic Pikachu and I covered him in Apoxy sculpt and made him look hairy. Their wasn't a whole lot of material involved, just a lot of time to groove all of it. It probably took a good 10 hours to make the hair look perfect. Kotaku has previously featured KodyKoala's amazing creations, such as Mecha Sonic and Zombie Yoshi. And no doubt, Kotaku will feature future ones! Until then, more at KodyKoala's site below.